This ridiculously amazing Asian Ramen Salad with Peanut Dressing will have you and your guests going back for thirds and fourths. 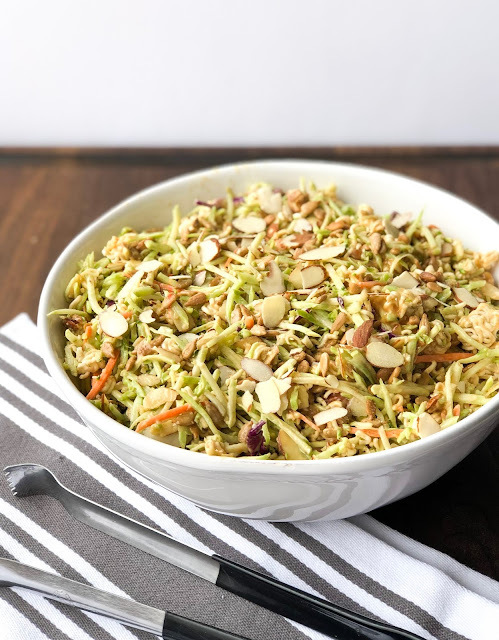 Everyone will be asking for the recipe and you’ll want to bring this easy dish to everything! It's super easy to throw together and the peanut dressing is delicious!! Make it with me! 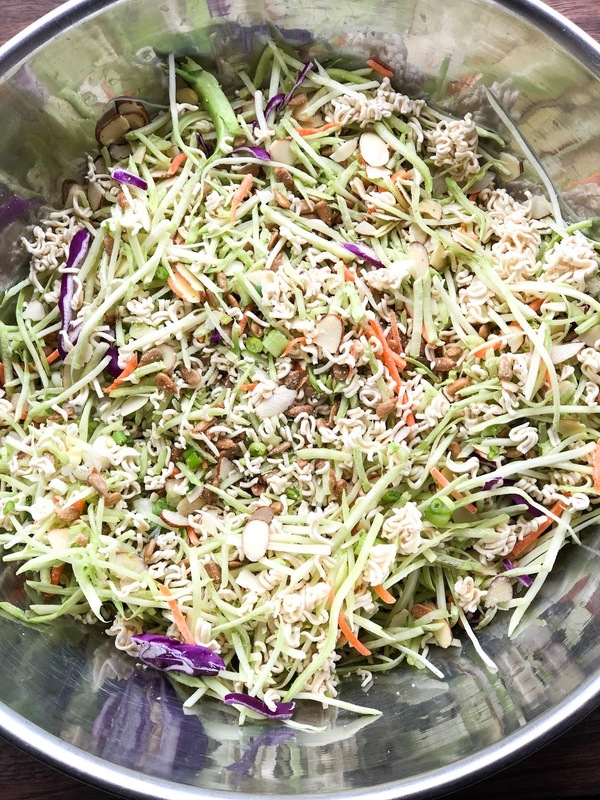 Ramen Salad? You are probably wondering what type of ramen we are using in this recipe. Your initial thought is probably correct, good old classic ramen noodles. Think freshman year survival food, and that's that ramen we are using! You can buy any flavor you have on hand, because we won't be adding the seasoning packet. 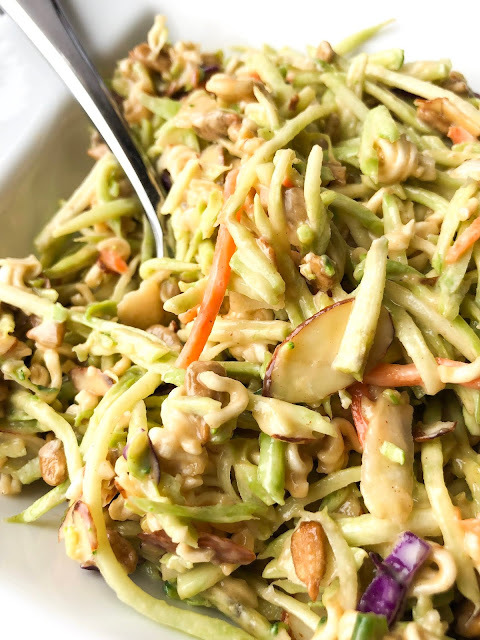 We are adding the dry noodles to this salad for a delicious crunch. Are the ramen noodles supposed to be crispy/uncooked? Yes. That’s the point. The crunchy ramen noodles give it texture and bite. They do get “soggy” after they have been sitting in the salad for awhile (since it soaks up the liquid). To avoid this, don’t add the ramen noodles until right before you serve if you want the crunchy texture. 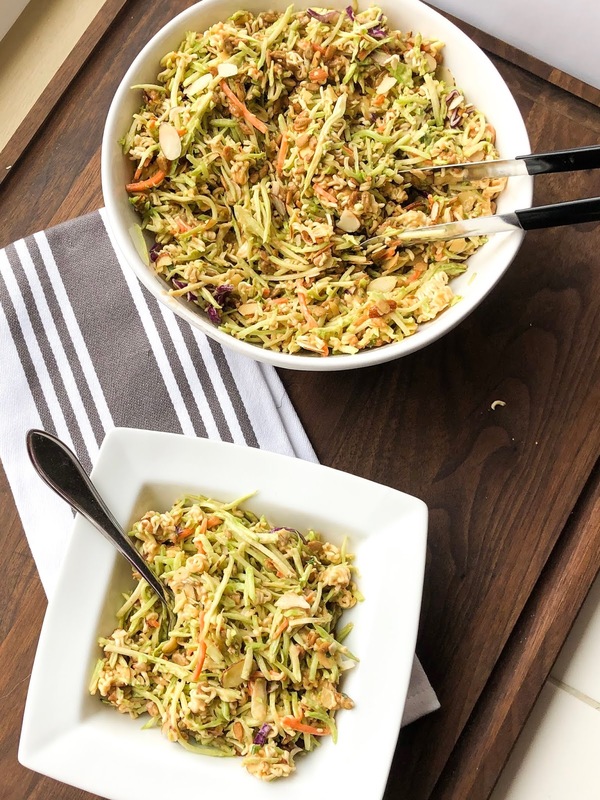 You can use any type of "slaw" mix you prefer in this recipe. 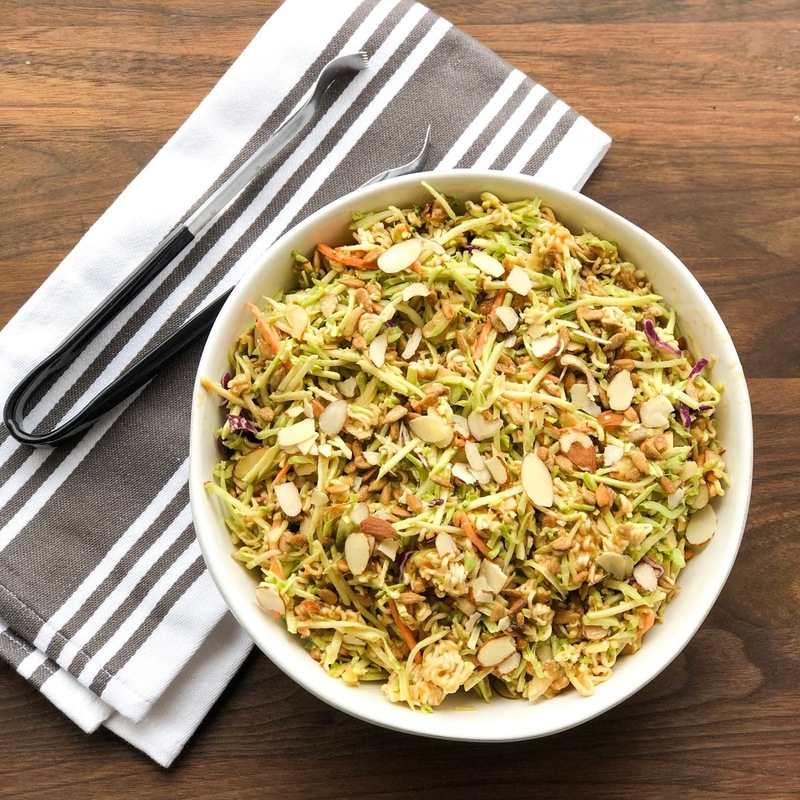 I like using broccoli slaw because it has a good texture and I like how it holds up when tossed in the dressing. Any slax mix will do! 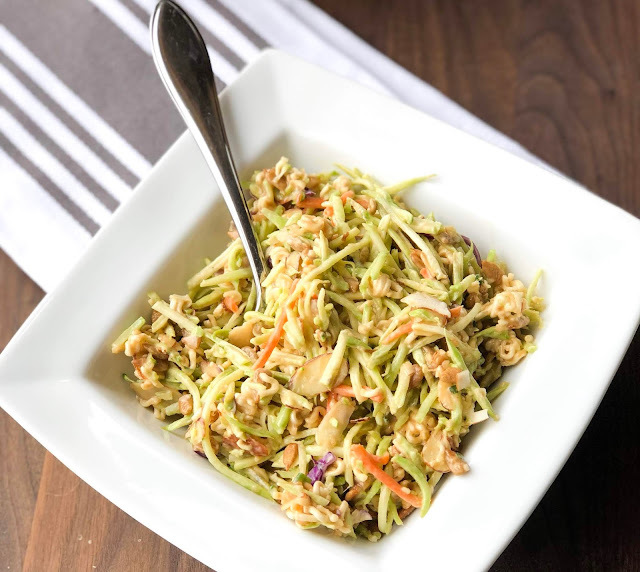 This recipe doesn't call for any chicken, but it would be delicious if you wanted to add it in! You could also add mandarin oranges to this if you wanted to add additional elements. In a mixing bowl, combine the slaw mix, sunflower seeds, almonds, and green onions. 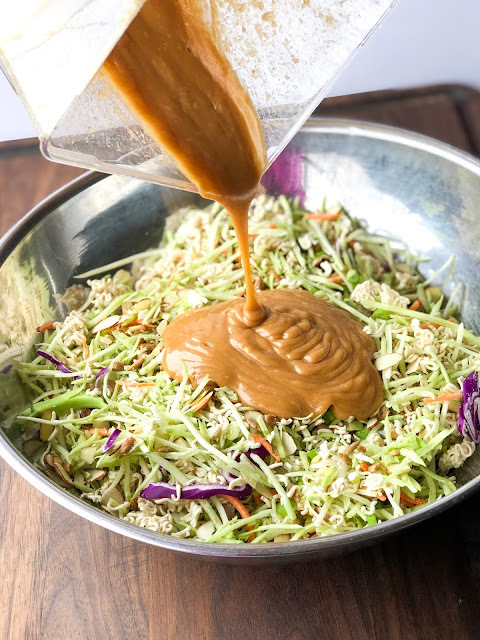 To a blender, add all of the ingredients for the peanut dressing and blend until smooth. If the dressing is too thick, add an additional tablespoon of water, until sauce is think, but stir pourable. 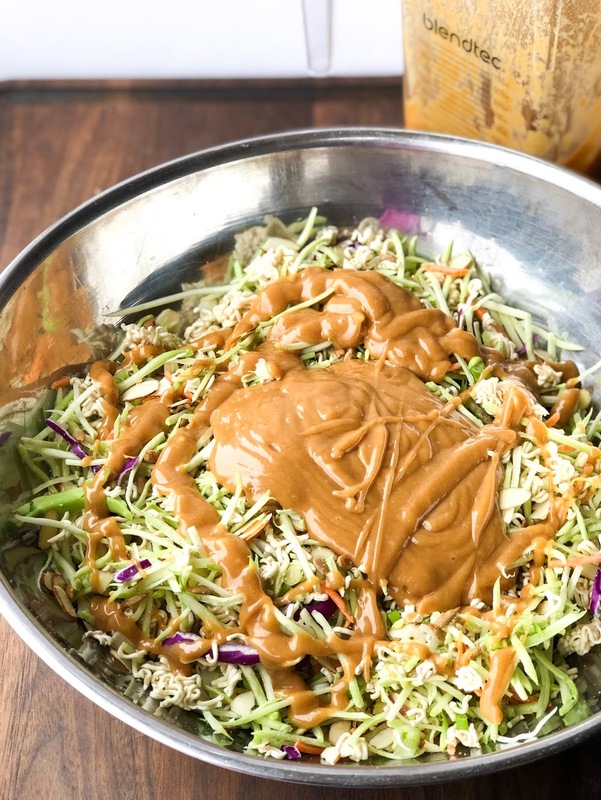 Pour Peanut Dressing over salad mix and toss until evenly coated. 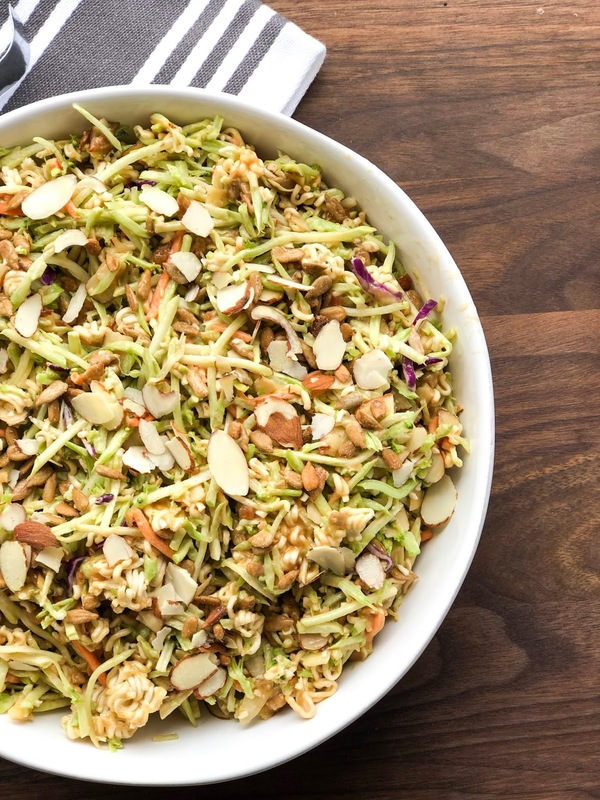 Cover and place in the fridge for at least 30 minutes, or until ready to serve. Then just before serving, fold in the ramen noodles.